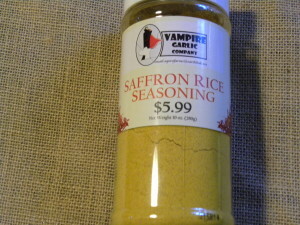 Saffron seasoning is a yellow-ish, free flowing powder containing salt, turmeric, onion, garlic, pepper, white pepper, celery, saffron, sugar, and vegetarian chicken broth. Use one tablespoon per cup of rice or try it in place of bouillon cubes for a new twist on soups and stews. Vegetarian chicken broth includes maltodextrin, salt, autolyzed yeast extract, onion, celery, carrots, parsley, garlic, spinach,oil, potato flour, extractives of spices, xanthan gum. GLUTEN FREE and contains NO MSG!